If you’re a regular reader of this blog, you know I occasionally write about medical topics related to wine. Perhaps this is because I’m a retired ophthalmologist. Today, the subject is sulfites. 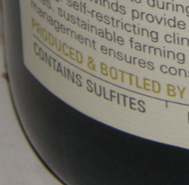 Sulfites are byproducts of sulfur dioxide used since the days of the Romans and Egyptians for cleaning wine containers. In the 1800s, they were approved for use in the United States, to preserve foods. Sulfites are routinely added during the winemaking process to either inhibit or kill bacteria and wild yeast, allowing rapid and clean fermentation of wine grapes. They’re also a natural and minor byproduct of yeast fermentation, and are often added to bottled wine as a preservative. Wine labels do not have to state the level of sulfites, but if it exceeds 10 parts per million, the FDA requires bottles to be labeled, “contains sulfites,” whether they are naturally occurring or added during winemaking. The only wines made without sulfites are those labeled “organic.” To bear the USDA organic seal, the wine must be made from organically grown grapes and may have naturally occurring sulfites, but the sulfite level must be less than 20 parts per million. (Wines without added sulfites cannot last long—18 months is the maximum—and should be drunk young.) Wines labeled “Made with Organic Grapes” can contain added sulfites, and this is an important distinction. Although sulfites are perfectly safe for most people, about 1 percent of individuals are particularly sulfite-sensitive; with asthmatics it’s closer to 5 percent. It’s theorized that sensitive individuals are deficient in the natural sulfite oxidase enzyme needed to break down sulfites in the liver. This leads to elevated sulfite levels. Reactions vary from skin flushing, itching and rash, to elevated blood pressure, nausea, wheezing, and even fatal anaphylactic shock. Since sulfite levels aren’t listed on the labels, it’s difficult to know which wines will affect you more. A blood test, known as the CAST test is about 50 percent reliable in diagnosing sulfite sensitivity. A definitive diagnosis requires testing in a hospital setting where the patient is sprayed with sulfur dioxide or given a sulfite solution to drink. Individuals can test themselves with dried apricots, which contain high levels of sulfites, but this should be avoided outside of a hospital setting if the person is highly sensitive. Mass produced wines contain higher sulfite concentrations since the wineries use generous sulfur dioxide on large production lines. Organic wines have the lowest sulfite levels. It’s a commonly held belief that headaches from wine are due to sulfites, but, in fact, the headaches are due to other substances contained within wine such as histamine and tyramine.